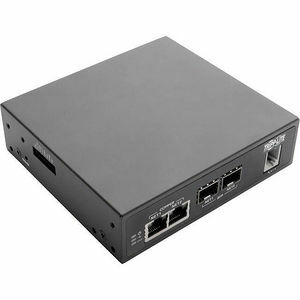 The B093-008-2E4U-M 8-port console server provides secure in-band (primary network) and out-of-band (alternate channel) remote access to serial- and network-connected routers, network switches, firewalls, PBX systems, UPS systems, PDUs and other devices. It offers reliable network connectivity with dual Gigabit primary and failover Ethernet ports for redundancy. You can use it in a wide variety of applications, including wiring closets, branch offices, point-of-sale and other remote sites where quick resolution of network issues is imperative. A V.92 serial data/fax modem enables out-of-band (alternate channel) access when remote sites experience a network outage. You can dial into the rack console from anywhere at any time, eliminating the costly need for additional USB modems that can be accidentally disconnected or have compatibility issues. The B093-008-2E4U-M supports the following security features and standards: PCI DSS 3.2, FIPS 140-2, SSL and SSH, stateful firewall, OpenVPN and IPSec VPN support. The embedded FIPS 140-2 OpenSSL cryptographic module is validated to meet FIPS 140-2 standards and has received Certificate #2473. The B093-008-2E4U-M comes with a 4-year warranty. It's manufactured in compliance with strict RoHS specifications, reflecting Tripp Lite's commitment to environmental responsibility.